But that’s pretty pretty useless if you have neither the password nor the disk. So in this article I wanted to show you two ways to reset the administrator password without a disk. I think Macbook Air users will find this article especially useful just keep in mind that you may lose your files after running this tool; therefore, make sure you have everything backed up. The other option is to delete the Apple Setup file to trick the Mac into thinking it just came off the truck from the factory. After deleting the Setup File and rebooting, you’ll see a “Welcome to Mac OS X” setup screen which will walk you through the process of creating a new admin account. To make it happen, we have to boot into something known as Single User Mode. This is a limited environment with no graphical user interface but is very helpful when you need to perform advanced troubleshooting. 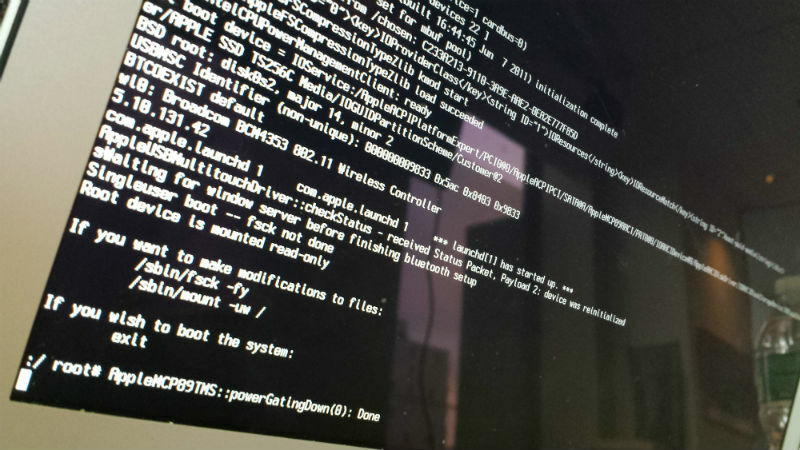 Reboot the Mac and hold down Command + s to enter Single User mode. Keep holding down Command + s until you see a black screen with white text. This mounts the root file system (the forward slash /) and tells the computer to change the status of any already mounted file systems (that’s the -u part of the command) and make sure it’s read-write (the w in the command). This looks a little more cryptic than the mount command but it’s not too hard to decipher if you break it into groups. Deleting this folder is the trick that forces the Mac to think it has a new lease on life. After executing this command, press the power button to turn the Mac back on and you’ll see the setup introduction screens. Thanks for this but will all files and programs be retained, or does this effectively wipe the system? YOU NEVER UPDATED THE POST WHERE DOES IT SAY THIS WILL WIPE ALL YOUR FILES!!!! I JUST WIPED ALL THE FIELS FOR ONE OF MY CLIENTS BUSINESS COMPUTERS!!!!!!!!!! i think there is a file recovery app for that right? Data is almost always recoverable, with the right tools. A professional on these matters can help. Whatever you do (to those reading this), don’t go to Geek Squad, they’re overpriced and mostly clueless without the magical software that Best Buy gives them to use. Talk to a few people who work professionally in IT. If they can’t help, they’ll probably know someone who can. for all that loose their files I found a video showing how to recover all. just check it here. This nearly wiped all the files I had, thousands of pictures and countless other thing, and didnt even work. DO NOT TRY THIS! its not working properly needed some help … please help after this cmd rm /var/db/ .AppleSetupDone ….. no dir show nothing there what to do ??? I’m in single user but the last prompt is “:/ root#” It just sits there and reappears when I press enter. What am I doing wrong? Can you not type? It says you’re in the root of the machine. and you have “Super User (Sudo)” actions. Did you physically turn the machine off and then turn it back on. After turning it back on. Hold CMD+S at the same time. My 2009 IMAC was not recognizing my password and therefore not allowing me to login after I replaced the hard drive and restored it from a time machine backup. I did this coding suggestion and it started up like a new computer but after finishing registering it things got funky. It had me go through the registration a couple of times and now when I reboot it gets stuck at the blue screen with the pinwheel… Please help! Sounds like a bad Time Machine Backup. Hi a week ago guy came in our store with MacBook Air (13-inch, Mid 2012) and problem is that he cannot do anything right now. Previously Windows 7 was installed and he tried to install OS X but all bunch of thing went wrong so now mac is looking for password which he doesn’t have. Problem is that Command + s is not working and I can’t enter Single User Mode. Can anybody help me or tell me what am I doing wrong? Thank you, the first act worked for us. Keep up the good work!!! So, I won’t be doing the Single User Mode method, since I don’t want to lose my files, but I’ve tried the recovery mode, and it just tells me my new password won’t save. Hey when I go into single user mode it pops up and then goes away as if it’s been blocked anyway to get around? And when I do the other one asks for a password that’s not mine any help? The single user mode will not wipe your files. By making the Mac think it’s a new setup, it will simply create a new account with administrator privileges. The files from the previous account are still there, but they’re inaccessible from the new account you created, because they are stored in another user’s folder. To be able to log in with your old account again, go to user manager (System Preferences – Users & Groups) and change the password for your old account. After that, login with that account and all your files should be accessible again. the password will work the only thing is that you have to put in your password then go up and click resart then try it out. What do you do when the command +s function doesn’t work??? I followed this and now all that is happening is the grey screen with the apple logo and the rotating wheel. Please help me urgently !!!!!!!! Creative analysis , Just to add my thoughts , if your business require to merge PDF or PNG files , my wife saw a tool here https://goo.gl/389DjE. I have a MacBook Pro running Sierra. The latest security update has caused me a major issue: the update changed my only account from admin to standard user. I’ve tried starting in the Single mode and discovered that the .AppleSetupDone file doesn’t exist: ergo; I’m not able to reboot in the setup mode. How can I either create a new admin account and/or change my account back to admin?